We’ve revolutionized the Gold Standard LightSheer with vacuum-assist technology and by dramatically increasing the spot size to 22×35 mm. The LightSheer DUET enables you to treat backs and legs comfortable in only 15 minutes, making hair removal profitable… without anesthetics and gels. * No topical anesthetic required. * Reduce treatment times up to 75%. * Grow your patient base. 3. Hair follicle is pulled closer to energy source. 4. Melanocytes are spread apart; blood flow is constricted. 8. Tip moved to next location. * Reduction in competing chromophores enables more efficient delivery of laser energy. * Lower required fluence levels produce a more comfortable procedure, eliminating the need for topical anesthetics. Larger spot size enables greater depth of penetration, for improved absorption of energy at the target follicle. “I’ve used several laser hair removal devices in my practice… LightSheer remains the ‘goldstandard’ because it is the most effective for targeting unwanted hair. Effectiveness, long lasting results, satisfied patients… all add up to repeat business and positive referrals.” – Beth Haney, NP. “Patients will love it. Nurses will love it… I recently treated a large gentleman’s back and in the 20 minutes it took to treat him, he was practically falling asleep – the treatment was that comfortable.” – Christine Dierickx, MD. * Improves pigmentation and texture. * Stimulates new skin and collagen formation. You will notice immediate improvement in the surface texture and color of the treated scars. In addition, skin responds to the ActiveFX treatment by stimulating organic growth of new collagen which results in continued smoothing of scars over time. What can you expect following DeepFX? You will notice softening of the scar tissue and increased tissue flexibility as the skin heals from the treatment. In addition, your skin will respond by stimulating growth of new collagen within the treated area for up to 6 months. Fractional Laser Treatment for burn scars. A new approach for the treatment of scars. * Permanently removes micro-columns of scar tissue. * Stimulates new organized collagen. Scars are marks left on our skin from burns, trauma, acne and surgical incisions, and are a part of the body’s natural healing process in response to bodily injury. Normally, the body stimulates collagen production in an organized matrix to mend the injury. However, scars are created when the healing process is overwhelmed and the collagen is created in a disorganized manner, causing thick scar tissue to form. Scars have a different texture and quality than the surrounding normal tissue, and can be classified into different types. What is ActiveFX™ and how does it work? 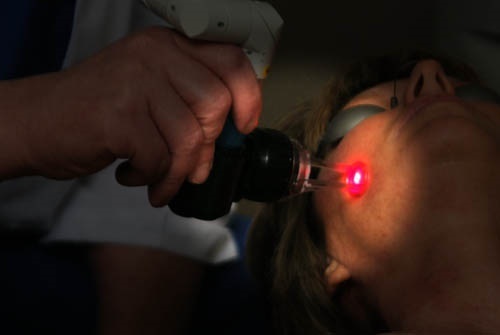 A high-energy beam of laser light interacts with the skin’s surface causing the upper layer to peel off and regenerate a layer of new skin resulting in improved scar coloration. Immediate collagen contraction occurs and new collagen formation is stimulated, improving scar tone and texture. The laser beam is applied in a fractional pattern, leaving “bridges” of untouched skin. This technique makes the healing process much faster and enables you to get back to normal activities sooner. The new collagen is produced in an organized manner, rather than the disorganized collagen matrix of a scar, resulting in the softening and smoothing of scars and improved texture. The laser beam is applied in a fractional pattern, leaving “bridges” of untouched skin. This technique makes the healing process much faster and enables you to get back to normal activities sooner. DeepFX™ is a fractional laser treatment for deep wrinkles and scars that yields remarkable results with minimal downtime. Microbeams precisely target the deep dermal layers of the skin, leaving healthy tissue intact to aid in regeneration. ActiveFX™ is a fractional laser treatment for pigmentation and fine lines that yields remarkable results with minimal downtime. This fractionated treatment targets the upper layers of the skin, leaving healthy tissue intact to aid in regeneration. The latest advancement in minimal downtime, fractional CO2 laser resurfacing for aging skin is offered by Dr. Johnson. We are now your location for for TOTALFX. Often called SMARTFX, it combines ActiveFX and DeepFX which gives a complete FX experience. Our skin changes over time, losing its youthful look and giving way to brown spots, wrinkles and laxity. In recent years there has been a growing number of aesthetic procedures available to treat the skin. ActiveFX – the result of the latest advances in laser technology – is a new procedure that yields remarkable, long lasting results with just one treatment. A fast, office-based procedure with minimal patient downtime, ActiveFX is your single-treatment solution for beautiful younger-looking skin. Is ActiveFX right for you? During an ActiveFX fractional resurfacing procedure, a high-energy beam of laser light interacts with the skin’s surface, causing the upper layer to peel off and regenerate a layer of new, healthy skin. With ActiveFX, only a fraction of the skin’s surface is treated. The laser beam is applied in a fractional pattern, leaving small “bridges” of untouched skin. This technique makes the healing process much faster and enables you to get back to your normal activities sooner. • Results of treatment are long-term and, with proper sun protection, can last for many years. • • Most effects of treatment become visible right away, whereas others – such as new collagen formation – build up gradually and results in continued smoothing over time. Therefore, most people continue to show improvement up to 6 months after the procedure. What can you expect from ActiveFX? Most physicians perform the procedure in the office with a topical anesthetic cream that is applied before the ActiveFX procedure begins. This is little to no pain associated with the procedure – most patients say they feel warmth similar to sunburn. You can drive yourself home after the procedure. With a gentle washing and moisturizing regimen, your photodamaged skin will begin to flake off within 2 days. After about 4 -7 days, your doctor will probably let you wear make-up. Pinkness should be gone in about a week. The latest advancement in minimal downtime, fractional laser treatment for aging skin. We are now your location for for TOTALFX. Often called SMARTFX, it combines ActiveFX and DeepFX which gives a complete FX experience. “As we age, says Dr. Johnson, “changes occure deep in the dermis that accumulate leading to visible signs that include fine lines, deep wrinkles, texture irregularities and scarring. 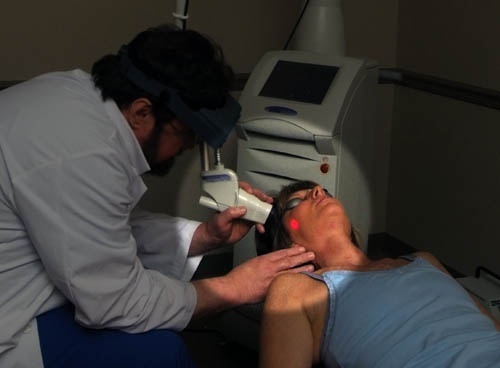 DeepFX is a revolutionary fractional laser technology for aged, sun-damaged or scarred skin. The low-downtime procedure uses fractional CO2 laser micro beams to precisely target the deep dermal layers of the skin. This stimulates a cascade of healing responses that leads to tissue regeneration and new collagen formation throughout the entire treatment area. And because only a fraction of the skin is actually touched by the laser, healing time can be limited to just a few days. DeepFX procedures involve treating only a fraction of the skinʼs surface, leaving bridges of untouched skin to aid in the regeneration process. Each laser pulse removes a narrow column of tissue while simultaneously treating surrounding skin. This deep heating causes immediate collagen remodeling. The result is softening and smoothing of wrinkles and scars, and improved skin texture. What is a DeepFX treatment like? office and lasts for about 20 minutes. Your doctor may use an anesthetic cream prior to treatment to aid with comfort. As the micro beams are applied, you will feel a warm sensation at the treatment area. Immediately following the treatment, your skin will feel warm and will be similar in appearance to a deep sunburn. Over the next several days you will follow a gentle washing and moisturizing regimen and avoid direct exposure to sunlight. As your skin heals, it will begin to flake and you will notice improvement in your wrinkles, fine lines and scars. Where can DeepFX be used? Who can get a DeepFX treatment? DeepFX is safe for most people; however it shouldn’t be used if you have taken Accutane in the past 12 months, have a history of keloid formation, have a history of poor wound healing, or demonstrate excessive or unusually prolonged erythematic, hyperpigmentation or hypo pigmentation upon laser test patching.